Sal’s by Victor, a popular pizzeria located in the Williamsburg Shopping Center on Richmond Road, was destroyed this morning in a massive fire. 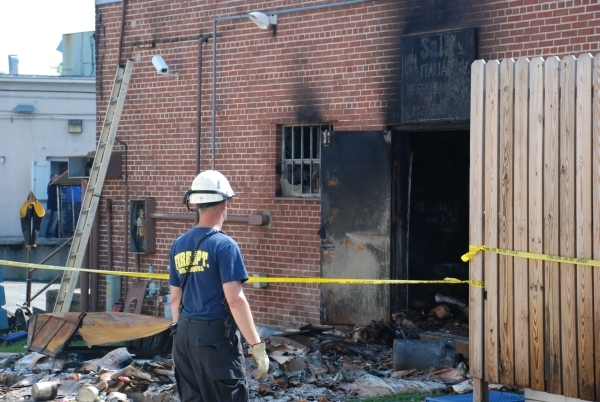 A firefighter examines a badly damaged back door and debris from the fire at the popular Italian restaurant. The blaze, reported by two passing police officers at 1:09 a.m., required 75 firefighters from Williamsburg, James City County, York County, Newport News and Camp Peary. It was finally brought under control at 5:43 a.m., according to Williamsburg Assistant Fire Marshall Chad Greedan. Although firefighters initially entered the restaurant on foot, they feared a structural collapse and were forced to retreat and battle the blaze from above. Two firefighters were taken to Sentara Williamsburg Hospital for minor injuries. Greedan could not specify the extent of the injuries, but said both had been released from the hospital by midmorning. The fire caused structural damage to much of the shopping center. As of late morning, fire officials had not yet determined the cause of the blaze, but an investigation has begun. The damage to Sal’s, a Williamsburg institution, was extreme. Much of the roof had been destroyed, and a look through the front of the restaurant showed charred kitchen supplies and furniture littering the floors. Victor Minichiello, the two-decade owner of Sal’s, was on the scene, and at one point could be seen hugging several employees. A Hallmark next to Sal’s took some damage as well, from smoke and water, as well as some roof damage. The restaurant's roof collapsed during the blaze. Most other stores in the shopping center suffered only slight smoke and water damage, Greedan said, but all were shut down because of electricity problems with the strip mall. Business owners sat in front of their stores, doors open to vent any remaining smoke, waving away customers. Radio Shack general manager Brenda Close referred customers to a location on Rochambeau Road, while EBL Salon and Day Spa owners Evelyn Summers and Devon Oliver noted they hoped to set up temporarily at an alternate location and plan to reopen within a few days or a week. Other affected businesses include an ABC Liquor, Books-A-Million and CVS. The lone open store was Bloom, a grocery store adjacent to Sal’s but located in a separate building. As of late morning, most fire trucks had departed, leaving structural engineers and insurance agents to comb through the debris. “It’s just been a long day,” Greedan said.